It has been a while since I watched a German production of a show that I have seen various times in its original English version. Hairspray is based on a movie (same title) from 1988 and is set in 1962 Baltimore, Maryland. It tells the story of Tracy Turnblad – a slightly overweight teenager – and her dream to dance on The Corny Collins shows and deals with racial problems and other injustices in the American society at the time. 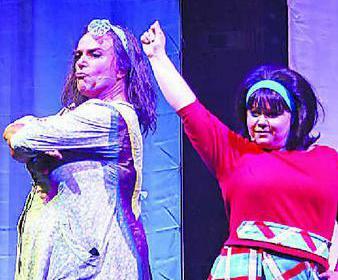 In this German production of the show Conny Braun takes on the part of Tracy Turnblad. While her acting and singing is good she really struggles with the dancing. Personally I can’t see Tracy being cast for the Corny Collins show if her dancing lacks any enthusiasm and drive. In addition to this she simply doesn’t look young enough to play a teenager so sadly I find her slightly miscast for the part. Uwe Kröger is definitely one of Germany’s best known musical performers. He’s played lead parts in various big productions in German-speaking countries and has acquired a huge fan base over the years. In Hairspray he is stepping into the shoes (and dress) of Tracy’s mother Edna Turnblad. I might be biased from seeing Michael Ball’s brilliant performance in the London production of the show several times but I have to say I wasn’t impressed by Uwe Kröger’s portrayal of the part. While the fact that Edna is played by a man is bound to cause extra laughs, this is not a panto character. Edna Turnblad is no drag queen which means she doesn’t behave like a man dressed up in women’s clothes. But that’s exactly how Uwe plays the part. His portrayal is so ridiculously over the top that it’s almost painful to look at him. He doesn’t manage to deliver the jokes and his Edna has no heart and soul. His singing is ok and the audience seemed to love “Du bist zeitlos für mich” (Timeless to me) – although I have the feeling the theatre was filled with Uwe Kröger fans who love everything he does without a second thought. Dominik Hees plays Tracy’s love interest Link Larkin. I have seen Dominik as Rum Tum Tugger in Cats last year and really enjoyed his performance back then. 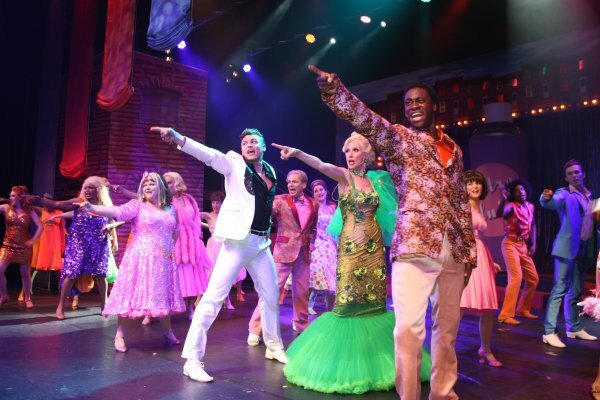 However in Hairspray he doesn’t manage to stand out. He’s just one of the “Nicest kids in town” – I admit I didn’t even realise who of the guys on stage was Link until he was first introduced. In my opinion Link needs to have a certain amount of charisma and has to stand out with his looks since the character himself is rather bland and two-dimensional. Dominik’s singing is nice especially in “Ohne dich” (Without love) and he does develop the character throughout the show. Still, a certain sparkle is missing. Andreas Zaron as Wilbur Turnblad does a good job and manages to bring out the quirky personality of the character. Nice performances from Eugene Boateng as Seaweed (except for a very strong English accent that makes it hard to understand what he is saying), Jessica Kessler as Penny Pingleton, Johanna Dost as Amber van Tussle and Tanja Schumann as Prudy Pingleton who all do well with the material they’ve been given. Marc Seitz plays tv show host Corny Collins with just the right amount of humour without turning the character into a complete joke. His Corny is hilariously over the top in front of the camera and determined and business-minded backstage. Deborah Woodson has an impressive voice and brings the roof down with her take on “Ich weiss wo ich war” (I know where I’ve been). However, her accent is extremely strong and makes it next to impossible to understand what she is saying sometimes. I enjoyed the performances of most of the supporting cast and ensemble. Bishat Araya, Kimmy Edwards and Taryn Nelson are a bit underwhelming as Dynamites though. Especially Taryn lacks the vocal power to deliver the usually impressive belts in “Willkommen in den Sixties” (Welcome to the 60s). As for the production itself – I’m not impressed I have to say. I have never been a fan of German translations but I do understand the need to make a show accessible for an audience that doesn’t speak English. And sometimes a translation works a treat – the brilliant German version of Mamma Mia springs to mind. However, in this show the translation is rather cringe-worthy. On the other hand the sound inside the theatre (which is a tent in case you didn’t know) is so incredibly bad that it wouldn’t make a difference if the cast were singing in Japanese. But – and that’s a big but – if you are going to translate a show (including the songs) then please do it completely and don’t keep random English phrases. What am I supposed to make of “Niemand stoppt den Beat, you can’t stop the beat” and similar half-German / half-English lines? The choreography fails to show the difference between the “Nicest kids in town” and the black kids. They just dance but Danny Costello (choreographer) doesn’t manage to point out that these two groups come from different worlds so to speak and have a completely different style. And what gave him the idea of choreographing the prison scene at the beginning of act two the way he did? Why are the prisoners suddenly dancing in front of the prison bars? Andreas Gergen (director) doesn’t make a difference between the Corny Collins show scenes which should be directed to a tv camera and the rest of the show. He stages every scene like a classic theatre scene which simply doesn’t work for all the Corny Collins Show parts of the production. 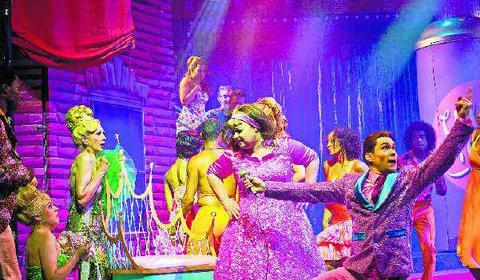 Hairspray is a feel good show with a socially critical touch. If staged properly it’s a pure joy to watch. For an audience that is not familiar with the brilliant English original and that is simply looking for light entertainment with catchy beats Hairspray in Merzig should be an ok show. Anyone who knows what this show can look like under the right circumstances – you will most likely be disappointed by this production. Hairspray is on at the Zeltpalast Merzig. For more info and to book tickets go to http://hairspray-zeltpalast.de (website in German! ).